Now that our SoFo Museum workshops are finished, we will take bookings for private workshops. The workshops run from an hour to two hours long and can be held at any beach on the east end, Moriches-Montauk! You will not have a finished batch at the end of the class, but we can teach you how to have one by the end of the day! We go through both solar and heat evaporation processes, ocean safety, and other east end information. Workshops can be held during all seasons, as long as you can brave the cold Northeast winds in the dead of winter! We will be at the Westhampton Beach Farmer's Market just thru Columbus Day weekend. Please make sure to stop by to say 'Hi' and buy your winter supply! We will roll out a few more blends this fall that we will sell exclusively online and at the Farmer's Market. That's right! The last public How to Make Sea Salt Workshop will be this Saturday 9/24 at Road D in Southampton. To make a reservation for this program, please call the museum at 631-537-9735. 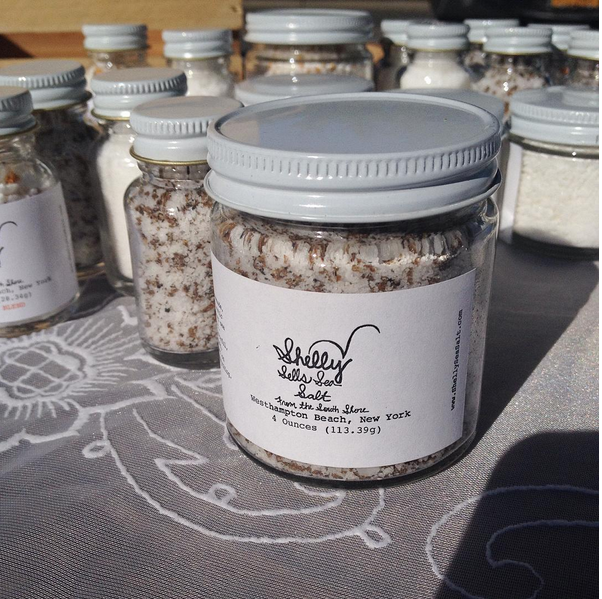 This session will discuss the process and how to make beauty products with your homemade, local sea salt! Big, big thank you to the South Fork Natural History Museum for partnering up with us for a THIRD season in a row. We love working with them (seriously the nicest staff EVER) and we look forward to next year's sea salt workshops! For the last few weeks we have partnered up with our friends over at Sang Lee Farms to showcase their heirloom tomato varietals, while they sample our Original Sea Salt at their stand. Their produce is out of this world amazing and all organically grown on the East End of Long Island. They even grow their own GINGER! Long Island grown GINGER! And it's DELICIOUS! Make sure you check them out and visit their Instagram for great farm/farm to table/Long Island social content! We are excited to partner up (for a third summer!) with the South Fork Natural History Museum as a part of their summer and fall workshop series! The workshops will be held at Road D beach in Southampton (free beach/free parking!). All ages are welcome. Please be prepared to go into the ocean, at least up to your knees and bring an air tight container! We are excited to kick off the farmer's market season this Saturday, May 7th in Westhampton Beach. We will have our edible salts and beauty products for sale. Keep an eye on our website, instagram, or facebook for new products and upcoming workshops and events. Please make sure you stop by our booth one Saturday and say hello! Three Years as SHELLY SELLS SEA SALT! Quick thanks to my family, friends, customers, and supporters for helping us get through our first three years as a company! I couldn't have done it without you. Bigger thanks to my Dad for pushing me to start this whole thing! Here is a little token of my appreciation. Don't forget that our limited Winter Citrus Blend is now for sale in The Salt Shop! Get it while supplies last! Thank you for the best year of our small company's life and cheers to an even better 2016!